The Dutch kroket is like Pernod in the south of France or Turrón in Alicante. A local food you discover and fall in love with while traveling but that seems to have lost all of its magic when you have it back home. So it’s not all too surprising, but nonetheless sad, that Dutch kroket chain Danku had to close doors of its NYC location. Danku had been promoting Dutch krokets and other fried food for the last few years. They ran a cool campaign with a very Dutch cow in Central Park against a NYC skyline. 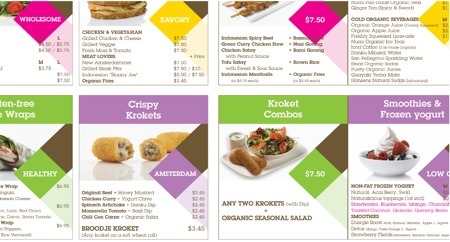 And were offering Dutch staples such as the famous “Broodje Kroket” as part of their quick lunch menu. Now both US review site Yelp as well Dutch restaurant news source Misset Horeca have reported that Danku is closed due to financial difficulties. There also are reports that Danku will re-open in another location, so some hope remains to relive those Amsterdam moments back in NYC.